The Falls project occupies the space between the 19th Century Stone Arch Bridge and the Lock, as well as within the Lock itself. Construction on the Lock and Falls Spillway was initiated by the Army Corp of Engineers in 1948 and completed in 1963. Several minor additions were completed subsequently to provide greater accessibility to the public. A one-acre park/plaza called The Forum will serve as the locus of recreational activities for the city of Minneapolis and its system of riverfront parks. The large public gathering space will also provide an urban focal point within the historic Saint Anthony Falls district. The surface of The Forum is mostly flat on the main plaza level and building entry but slopes up gently connecting to the Stone Arch Bridge and Lock surfaces. By positioning The Forum one level below the lock deck, it is accessible through the stone arches of the bridge on foot, bicycle, or car. A new urban space is defined and a respectful relationship with the historic infrastructure established. The majority of the building program is below The Forum or within the lock. The existing Observation Tower is used to make vertical connections throughout the six levels of new construction. 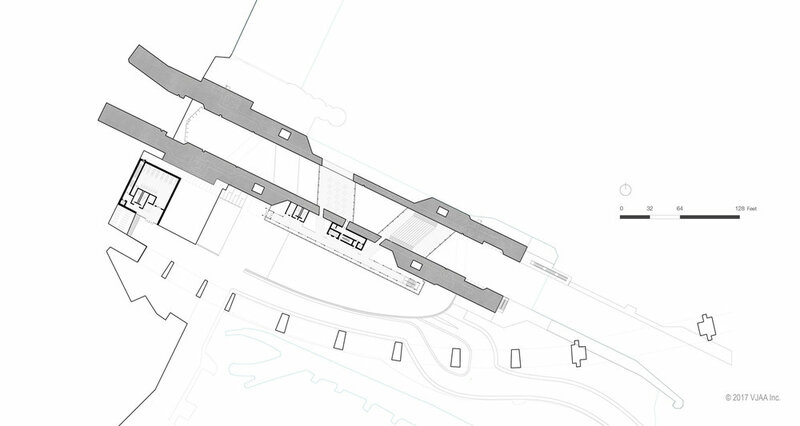 Parallel with the Lock wall, a new entry lobby and visitor services space is positioned to provide access to the facility. Nicknamed “The Gantry”, a tubular box-truss defines the main lobby and circulation space connecting to the vertical circulation. 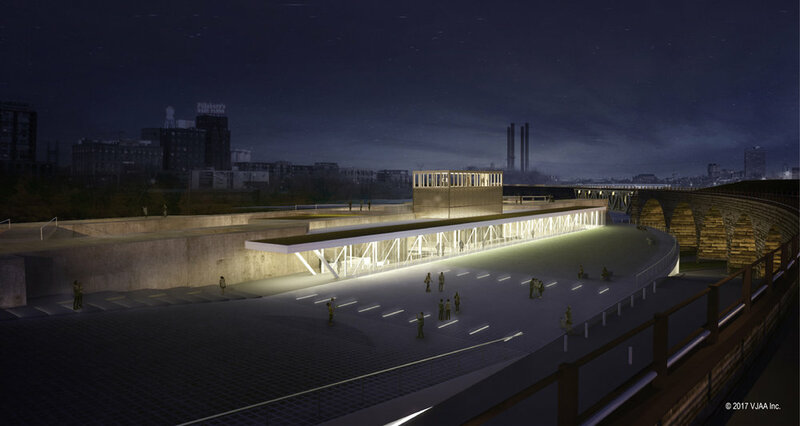 The gantry floats within an incision through the main plaza surface providing connectivity and natural light to the Events and Exhibition level below. The large spans of the gantry truss provide dramatic views of the previously subterranean lock walls. Other programmatic elements are located within the lock itself and accessed from the gantry. 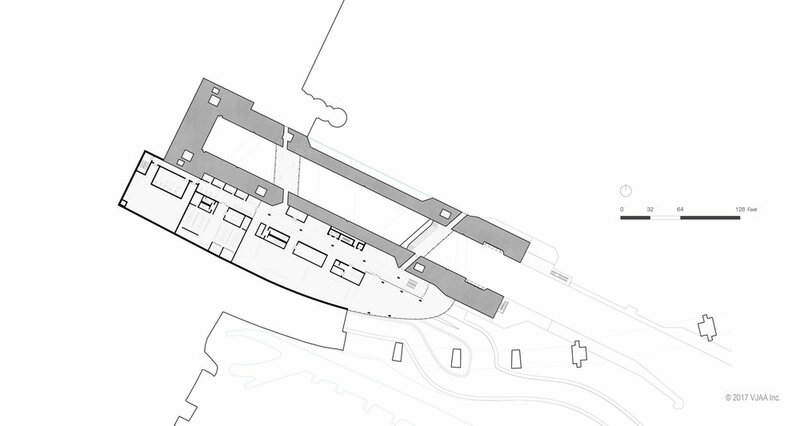 They include the café, auditorium, and lock related exhibition space entered from below the structure. The occupation of the lock interior is an exciting grotto-like experience that was previously only available to boat passengers. Additional space is provided for administrative offices, equipment rental, light concessions, restrooms for the various park spaces, and security. Below the plaza and exhibition floor, 235 parking spaces are provided on two levels with access at the southeast end of the structure. Saint Anthony Falls has become one of the most popular destinations in Minnesota, with millions of international and local visitors each year. 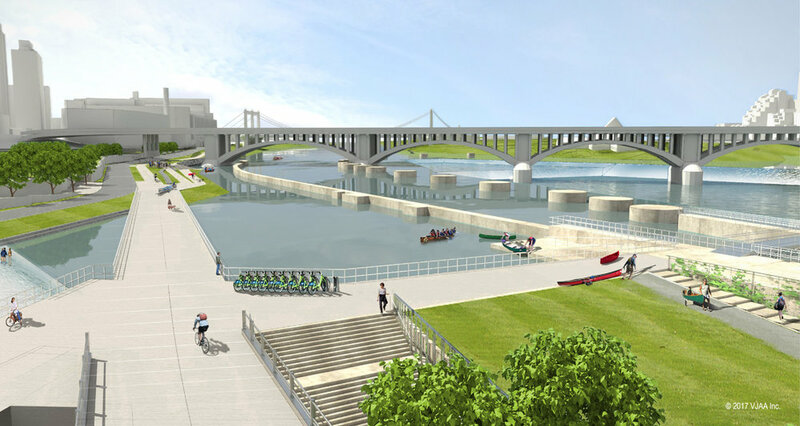 With the completion of The Falls and the opening of the lock structure to a wider public coupled with diverse programming, the use of the riverfront is anticipated to grow dramatically. The Forum will become Minneapolis’ most significant public space. Programming is expected to include general tourism, water sports related events, art festivals like Northern Spark, music festivals, outdoor markets, corporate parties and weddings, and major holiday events like the 4th of July fireworks displays over the Falls. The facility will be funded through the non-profit and further supported with revenue from parking and facility rental. *All rights reserved. Reproduction with permission only.